Home / Dog chews / Save your slippers! 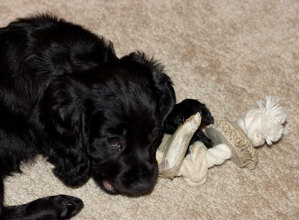 My sister got a new puppy yesterday, and sure enough the little pup loves to chew on everything! Lucky for my sister, she had an Antler Creek Antler Rope Chew ready- the puppy loves it!